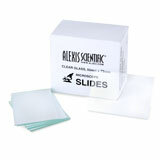 Slides - Case of 20 Boxes of 72ea (1440pcs total) Plain Large 2 x 3 in. Slides - Case of 20 Boxes of 72 ea. (1440pcs) Plain Large 2 x 3 in. Note: These slides are twice as large as 'normal' microscope slides.